Instead of talking about “X tips to grow your traffic by veryspecificpercent% this year”, let’s instead talk about some SaaS SEO strategies that, when applied over time, will give you incredible leverage off of which to continue building your company. Strategies are different from tactics. It’s sad that it needs to be said, but in much of the content you read online you are sold a bunch of tactics that do not have a strategy behind them. We will increase our organic visibility in the search engines through onsite technical SEO, quality and ongoing keyword research to identify potential high-converting and high-traffic keywords relevant to our business, consistent competitor tracking to identify opportunities and vulnerabilities in our competitors and ourselves, consistent content development, external distribution of our content to earn links, and the vision towards becoming the go-to resource for [topic] in order to build brand awareness. At its base, this is SEO. You do solid onpage SEO, identify your top keywords (traffic coupled with potential conversion) for your product pages, conduct ongoing research into content you should develop to widen the top of your customer funnel (from awareness down through conversion), create content to satisfy the needs of your potential customers, leverage your knowledge and story to drive opportunities for press to drive links, and continually work towards the goal of becoming the go-to place to accomplish what your potential customers need. SEO is not one-and-done. You do not “do my site’s SEO” any more than you develop a new feature for your software, set it live to your users, and then move on to developing the next one. You simply don’t do that. You do the research into what your customers need, you build that and get feedback along the way, then you release it. After you release the new feature, you monitor it for bugs, fix those as well as you can, and have a plan set forth for adoption of the new feature. SEO works exactly the same way, if you want it to succeed and make a difference for your business. And in a SaaS business like yours that is looking to scale from mid-six figures in revenue to seven figures and beyond, scalability is key. You’re looking to drive a lot of attention and a lot of traffic through the door, and SEO is a great way to get you there. Most SaaS companies I speak with are not clear on who their ideal audience is or the kind of business with whom they best work. At the point you are, you should probably understand whether you are going for enterprise (big ocean, fewer fish) customers and thus require a sales team, or whether you are able to make the self-service model work at scale. Both have their positives and negatives, and you hopefully know which one is your audience if you are approaching a million in ARR. Now that you know who your audience is, you can target those ideal people with content on your site. Say you run a “financial intelligence” software company. Basically, you provide a platform for them to plug in all of their data and get a one-shot view into their finances. We’re talking personal finances here, not business finances. It’s a crowded space, but you have a special sauce that will let you overtake the incumbents. At your core you are a financial dashboard software company, not a services company. So your messaging needs to be around that and who you do it for. 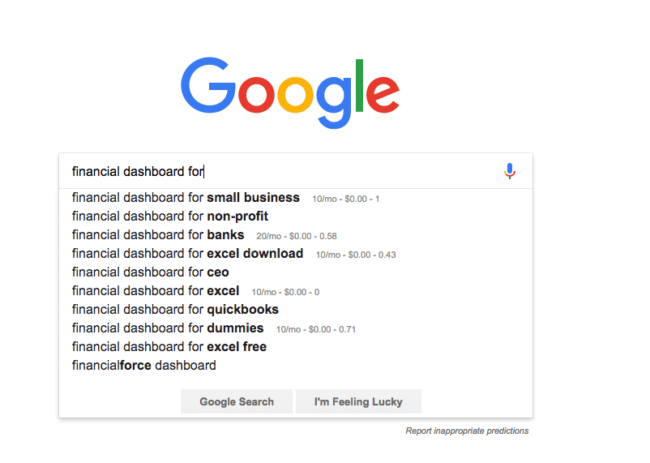 You look in SEMrush and see that [financial dashboard] has 380 exact searches per month, with a lot of long tail traffic around it. Then you can go deeper using SEMrush (paid tool) or Moz Explorer (paid tool). Google’s Adwords tool can get you started, but their volume ranges are not to be trusted. If you think that you can rank for semi-competitive keywords without links from other websites, you will have a bad time. We’ll talk about links in the next section, but the best links start with consistent content development that builds your brand in the space as a thought leaders, provides outsized value across the conversion funnel, and is then used for bigger content launches that earn attention, social shares, press (links), email addresses, and search traffic all on its own. We talked about defining your personas and market above, so you should know who your best customer is. From here, you can put together a comprehensive plan to create content that matters, get in front of your audience with new material, and use this to build links that help your content rank so that others can discover you as well. See how it’s a virtuous cycle? Let’s talk for a minute about the content you’re developing and the topics you’re covering, going back to when your company started. As a SaaS company starting out, your marketing was likely around your founding story and press around launching, funding, and whatever else pertains to your company. You do whatever is needed to get it off the ground, and that includes telling your or your founder’s story to anyone who would listen. You ground it out to get those first 100 customers and 1,000 true fans. As your company grows and matures, and hits the seven figure revenue mark and beyond, things start to change. You’re becoming a player in your vertical, and may still be the only player, and thus you have some name recognition. Now you get to build a content strategy that is consistent, targeted, and efficient at being spread. Since we are talking about SEO in this article, I’m not going to go deep into email marketing strategies. But I would be remiss (and doing you a disservice) to not mention that email is one of the best ways to spread your content to people who have said that they are specifically interested in hearing from you. Now on to your content strategy. Think about the content that you consume online. A few years back, most of us who are now in our 30s would follow specific websites by subscribing to their RSS feeds. We knew that we could expect consistent content from them, and we read everything. Google Reader was my regular stop, not Twitter. Those days have passed and people now follow other people instead of entities, for the most part. But, the content that gets spread and shared tends to be content that is regularly produced and comprehensive. I’m not talking about content for the sake of content here. The idea of “SEO content” should have died years ago, because it doesn’t work. Rarely do you conduct a Google search and come across some 500 word article that some random company wrote on their blog for the sake of “targeting SEO keywords”. Content works for SEO when you apply effort over a long period of time. And because content is hard, you must get on a regular publishing schedule because otherwise you likely will not publish. Some of you are like me and write/publish because you love it, but I’d also bet that many of you are not that way and need some external motivation (traffic, money, peer pressure, accountability) to do it. When it comes to content frequency, there is no correct frequency. There is no evidence that publishing more or less encourages Googlebot to crawl you more often, so let go of that idea if you’ve heard it. Instead, focus on what is sustainable for your business. If that’s one longform piece of content per week, then commit to that. This has been shown to correlate positively to increased traffic and conversions from SEO simply because content = more keywords targeted = potential for more links acquired = more traffic. According to research, just declaring that you want to do something or watching motivating videos or even planning something out doesn’t correlate to a stronger likelihood of success. Declaring your intention to do it and committing to a schedule. So pick a day of the week (or two days per week) and publish on those every week, rain or shine. We’ve already talked about defining your audience and learning who your best customer is. As you’re planning out and creating, you should have one specific audience or person in mind, and write for that person. Don’t try to cover every potential person that could be reading your article. Write for the person at the company that you are trying to acquire, such as VPs of Marketing at SaaS companies doing a million or more dollars a year in revenue. It should go without saying, but you can’t just write content and expect it to be found. “Build it and they will come” does not happen, so let’s stop playing on a field of dreams and instead set up content to be spreadable. Build an email list and be in contact with them consistently (see creating content consistently above). Have influencers you email to spread the word. Have a group of friends who will promote your stuff. 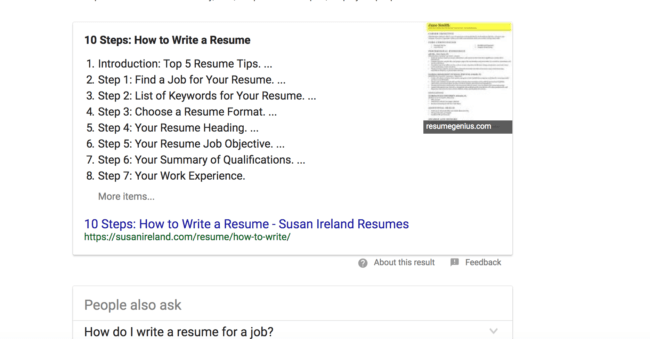 This random website has the Featured Snippet for [how to write a resume], which has 90,500 exact monthly searches in Google! This article is probably receiving ~75% of the clicks for this query. That is a lot of traffic, and can be replicated. To start, check out this study on SEMrush by Credo agency Ghergich. A mistake I see a lot of SaaS companies make is not thinking about how their website is constructed and organized to lead to optimal traffic and conversions. This is, in my experience, many SaaS companies are started by developers who know how to build technology, but are not focused on the user and their needs. Consequently, I then hear from these companies about their “marketing site.” If you’ve ever worked inside a tech company then you probably know that marketing teams are rarely respected by the other business units. Developers don’t want to work on things pertaining to audience acquisition, designers think they’d be stuck designing visual marketing materials, and because analytics and attribution are tough (and many marketing teams are bad at measuring the efficacy of their efforts, which leads to a lot of wasted effort) then business units within companies think marketing is a waste of money, time, and effort. Instead of thinking about “marketing pages” like specific landing pages (which have their place for campaigns, but often are fairly worthless for SEO), think about types of pages that you have on your site. Of course you have your homepage, your About page, and other basic pages. But what about your product pages? Your persona pages? Your demo pages that hit different stages of the funnel? On Credo (we’re a lead gen company, but with backend technology) we have a lot of different taxonomies like services, business verticals, and more in addition to blog posts, guides (email and ecommerce), and conversion-oriented pages. These are the pages that rank and drive traffic, so don’t neglect them. A one-page website may convert well, but you miss out on so much “free” organic traffic that the conversion rate means very little. Blow open the top of that funnel. If you’re looking for help growing your SaaS business, you can check out the SaaS SEO companies listed on Credo. We’d love to connect you with the right one if you schedule a call. If you’ve already been working on the above by defining your audience and writing to them, publishing content and guides consistently, thinking about templates and page types instead of individual pages, and promoting your content and business to acquire links to rank better, now you may move onto Stage 2 of SEO – the actual optimization. After all, you can’t optimize what you don’t have. I’ve helped you learn to swim first, so now let’s do some swimming. Let’s assume that you have a couple hundred pages on your site, many targeted to specific terms in your industry. Using Google’s Search Console, you can identify the terms for which you are ranking but have relatively low clickthrough rates. These pages are in danger of not ranking as well since they are not satisfying the user intent. I have a few terms there that are not super relevant for the audience I might be targeting (eg “long url example”), but there are some there that are very relevant for my business, such as “how long does SEO take” and “how to find clients for consulting business” where I could improve my clickthrough rates to get more traffic. Optimizing your titles and meta descriptions for clicks. Use the relevant keywords for your article so Google bolds them, entice the click with your title. Get the Featured Snippet (mentioned above). I could do this for a couple of the above and bolster my clickthrough rate. The key with this strategy is prioritizing the keywords that are relevant to your business while you ignore the terms that are not relevant to your business. I rank for some relatively random terms (like “meta author”) with old posts, but they’re not relevant to my business now because they’re targeted to the wrong users. So I won’t waste time trying to increase those, but terms like “how to get consulting clients” are very relevant to my interests. Often when we’re talking about SEO strategies we talk about creating content, optimizing your site structure, and all the typical “SEO” things. But when you have a decent employee count (more than 20 usually), communication becomes hard and people have competing interests. All of these are required, so getting everyone on the same page that audience acquisition is important is one of the best things you can do to drive SEO forward. At companies I’ve worked for in the past, SEO only really worked when we had buy-in across the company and a dedicated team working on it. This meant that budgets were allocated specifically for SEO (for content primarily), engineers and designers were assigned to help with SEO tasks (both front end and back end technically), the analytics and business teams understood the purpose and helped to measure the return on efforts, and sales understood that they were the front line of communication with clients and could help move the needle in that direction as well. You don’t have to go as far as a Zillow who called a “play” where basically the whole company was marching towards a specific traffic goal, but I’m also not going to say you shouldn’t go that far. The point is, getting your whole team onboard is key to SEO success. This means educational time around SEO for the company, consistent messaging about SEO’s importance in all-company meetings, and consistent reporting on progress made. Break down the silos and you’ll be more effective than building a few more links or writing some more content. Thanks for reading. I hope this post has been helpful for you in thinking about SEO strategies for your SaaS company. If you’re looking for help with your SaaS SEO, we’d love to chat with you (start here) and can get you connected with the right companies for your needs. Thanks for this! Good info. I loved the Zillow reference, mostly because I was advising a company at the same time Zillow got focused and their traffic got CRUSHED. Live and learn, right?